» Albany projects: Details galore! 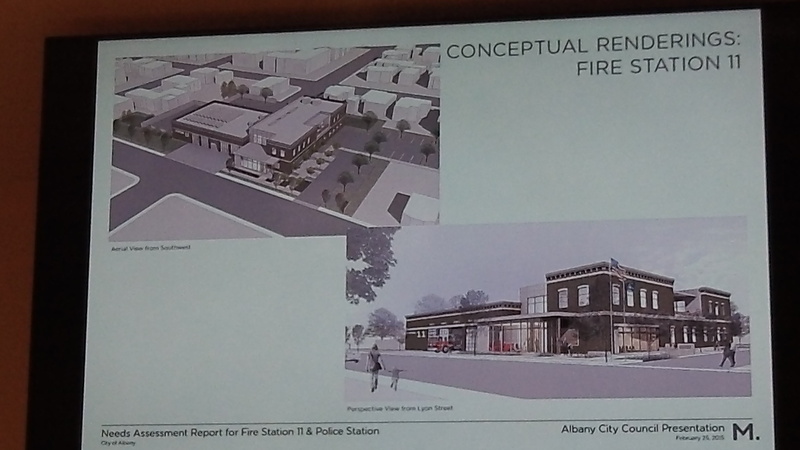 Two views of the fire station project, which would cover Sixth Avenue on Lyon Street. Albany voters now have a chance to get all the specifics they might want on the proposed new police headquarters and main fire station, the objects of a bond election set for May 19. In 2013, some blamed the defeat of a previous, larger bond issue on a lack of specifics. On Wednesday night, the city council got the a mountain of details from Mackenzie, the design firm hired to develop them from the recommendations of the police and departments and a citizens’ task force that spent nearly a year of meetings on the projects. The exterior designs of both buildings are similar to those shown earlier, except that the new version of the fire station on Lyon Street looks more in line with the downtown neighborhood. Total estimated cost: $24.1 million, slightly lower than anticipated because the designers were able to save some space. The police station would cost $15,380,810 and the fire station $8,737,742. The amounts include everything including contingencies, even the 1 percent of construction costs for art prescribed by a city ordinance, as Mayor Sharon Konopa explained. If voters approve the proposed $18 million bond issue, the projects could be put out for bid this fall. Construction could start in March 2016, and both buildings could be finished a year and a half later. That’s according to Jeff Rhys Humphries, Mackenzie’s director of architecture who presented the council with half-inch-think books describing every detail of each project. The city will no doubt make the books available at each public library. Look for them there. Meanwhile, Circuit Judge Dan Murphy has set March 5 as the date when he plans to hear and decide on two challenges to the city’s ballot title for the bond election. Tom Cordier and Gordon Shadle filed separate petitions saying the title was unfair and otherwise deficient. In addition to the proceeds from the proposed bond, the council intends to pay for the projects with money from the city’s Pepsi settlement and at least $1.4 million from the CARA urban renewal agency. The CARA board will consider later if it can contribute additional sums to fire station, such as street trees and any space in the building used to display items from the city’s fire museum. 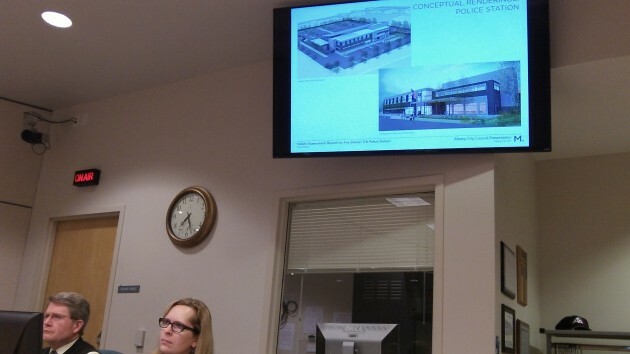 Police station renderings appear on screen above Finance Director Stewart Taylor and City Clerk Mary Dibble. Kudos to the City Council for listening to Albany residents and providing much needed details to voters. We certainly can’t complain that the city is asking us to approve a blank check like they did in Nov 2013. But $241,000 will be spent on art? This is a waste of money and the $241,000 would be better spent on providing public safety services. When I seek help at the police and fire stations, I’m not there to feel good about the beauty of their buildings. I suspect voters will not respond positively to this bit of news. It’s only 1/6 of $1,000,000. Chicken feed to a city council member!